I've dreamed of preparing a Renaissance dish ever since I visited a Renaissance Festival in the United States. I noticed that one of the most popular (and more unusual) foods there was the turkey drum, and that was a good starting point. One challenge was to make it tender and moist: this is achieved through slow simmering followed by a quick broil. And what can go better next it, other than some smooth flavorful beans? - Put the smoked turkey in about a gallon of water (they should be completely covered). Add three or four bay leaves and a teaspoon of whole black pepper seeds (if you have any). Bring to a boil, then reduce the heat and let simmer for two hours and a half - this helps the drums get moist and tender. When you see the meat start to fall off the bone, place in a tray with a bit of oil and broil in the oven for a few minutes - this should add a nice red tint to the presentation. Note: we're not planning to cook in the oven, just to give it the color, so use the highest temperature possible and keep an eye on the meat. Also, do not discard the water where the turkey simmered - it is a great base for a soup or a stew. - We will prepare the beans while the turkey is cooking. We need one pot and one extra large pan. Place the beans in the pot, cover them in water, bring to a boil, then discard the water. Repeat this five times - it helps eliminate whatever makes beans gassy. - Meanwhile, finely dice the carrot, parsnip, onion, yellow squash, tomatoes, and garlic cloves. Place them in a pan with half a cup of cooking oil, and simmer on low heat while the beans are cooking. We want them to almost become a puree - it adds a delicious base for the recipe and keeps everyone guessing how you achieved the flavor with no apparent help. - Once the beans have boiled in five waters, drain them, and add them to the simmering vegetables. Add about four bay leaves, a tablespoon of thyme, salt, pepper, and a a touch of chili pepper (to taste). Transfer a cup of water from the smoked turkey pot (for extra flavor), mix, and continue simmering for half an hour. - When the beans with vegetables are cooked, add some chopped parsley, mix, and remove from heat. Or save the parsley to decorate at serving time (either works equally well). 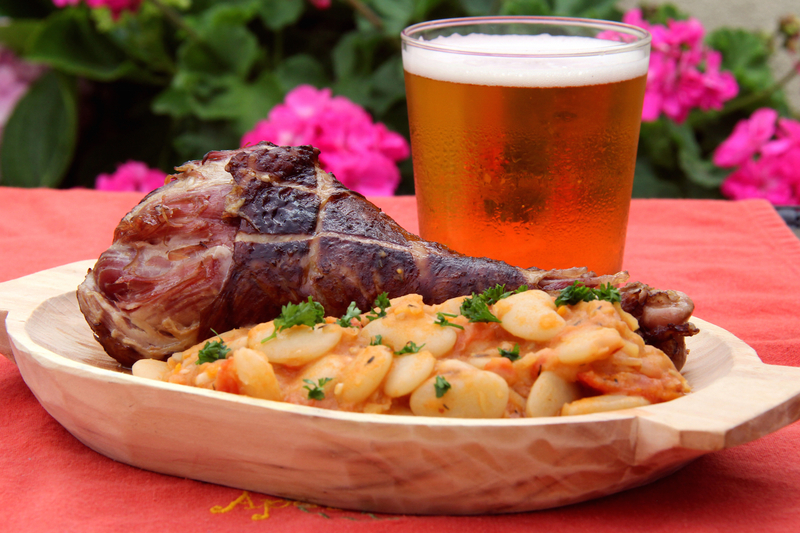 - Serve the beans alongside the turkey legs, while they're still hot. - Sprinkle finely chopped dill on top of the dish to add an extra splash of freshness to the presentation. - We love beans with fresh onions (or scallions) in Romania; they really go well together. - Serve alongside a cold beer. I wish I had my stein handy when I took the picture. - If you really want to go all in, consider handholding the drums while serving, and make barbaric sounds of enjoyment to show the cook how much you appreciate devouring the dish. I'm sure the kids would love this part. Turkeys are from the new world and we're unknown to Europe in the dark ages. And the beans in the picture look like Lima beans, also from the new world. You must mean goose and fava beans. Good points, both (yes, those are Lima beans). I guess I was thinking about a Renaissance Feast. I'll go ahead and update the title and content of the post. Thank you for the note.